Shop with Confidence! Honest and reliability you can trust! Antique Gold Metal Earring Displays are our latest arrivals. Our new color looks beautiful up close and earrings look even better! This special color is sure to bring life and style to anywhere it is placed, whether it be for your store or for your earring collection in your bedroom. *Click on the images to be directed to these items on our site! A jeweler doesnâ€™t want to simply sell an item to a customer.Â They want to sell something that is so striking that its inclusion in the customerâ€™s life becomes a part of a special memory.Â That memory can be of a graduation, an anniversary, or an engagement.Â For a watch, necklace, or ring to become a part of that memory it must be noticed first, however.Â It must stand out in a room and call to a customer as soon as they walk through the doors.Â That customer, whether it be a mother, husband, or friend, must be able to imagine that special piece on their special someone.Â Jewelry displays, whether they be showcases or sculpted figurines, are crafted precisely to bring that special piece to the eyes of the customer. Chicago is one of the worldâ€™s great cities and, within all of its neighborhoods, during all of its seasons, there are people who are getting married, celebrating anniversaries, or moving on to another stage in their lives.Â The retailers who will supply them with the valuables that mark each of these transitions will also want to select the best jewelry display Chicago has to offer.Â Our product line is designed specifically to provide the jeweler with the displays they need to bring the customer together with the special piece they have been looking for. Many customers, especially those who are new to shopping for jewelry, often have a difficult time either selecting a specific piece or knowing what it is that theyâ€™re looking for.Â Our jewelry display sets, like the reserved Set 114L or brightly colored Set 56, are designed to help the shopper compare several different brands or pieces within a single line at once.Â They also make it easier for the clerk to explain the exact differences between each brand or item, as display sets can present several pieces of jewelry together in a dignified way. Our line of figurines, however, are adept at drawing the eyes of the shopper to a specific piece.Â This is because, whether they are in the form of a neckline, arm, or bust, they help the customer imagine what their loved one would look like wearing the featured piece.Â For first time jewelry buyers the various brands and pieces that are available can be a bit overwhelming.Â A finely crafted figurine, however, makes it easier for them to picture their own loved one wearing the charming bracelet or necklace thatâ€™s adorning the sculptured form before them. A man likes to show confidence at all times, especially in front of the woman he loves.Â When the time comes to buy that woman something that will symbolize that love, however, a man, especially a young man, can enter a jewelry store with a sense of fear.Â He might know what heâ€™s doing at work, he may even have some confidence in life but he can be paralyzed or overwhelmed when the moment comes to buy a specific bracelet, necklace, or ring.Â He needs help finding the â€˜oneâ€™. Itâ€™s at this moment, when a man first steps into a shop, that a jewelry display can stave off that hesitation and, in the sweep of one glance, elevate the piece heâ€™s looking for, the ring he will put on her finger or necklace he will slip around her neck, and cause him to fall in love all over again.Â This is because a figurine jewelry display, with lines crafted along those of the one who will eventually be adorned with what it is showing, will remind that young man of why he came into the store in the first place.Â When he walks into the room, above all the other glimmering sale items and milling customers, heâ€™ll see the piece featured on the figurine because, even if in an abstract way, that figurine will remind him of â€˜herâ€™. 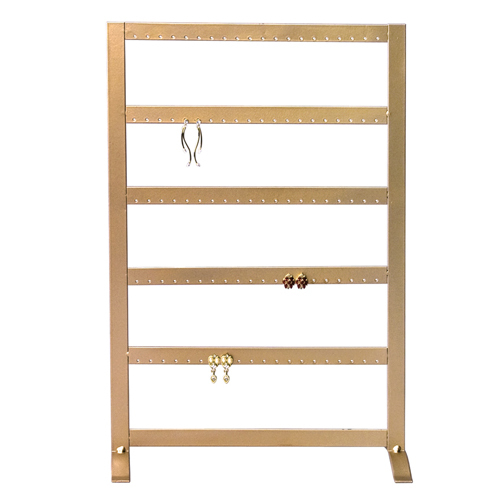 We take pride in providing retailers with jewelry display supplies that can help both the buyer and seller at such crucial moments.Â The decisions that are involved in buying finely crafted pieces can be taxing, sometimes confusing, for both and so weâ€™re pleased to present jewelry displays, both figurines and showcases, that help accentuate the beauty any piece will carry in its eventual setting. Our series of necklines is ideal for any retailer who carries a diverse series of necklaces.Â Likewise, we offer polystyrene figurines that can be used to display items like earrings, bracelets, necklaces, and rings.Â Among these are full hand and arm figurines as well as sculpted feet and bust lines.Â Remember, when that proverbial young man walks through the door he will be a bit overwhelmed by all that your shop has to offer.Â He will notice a necklace or ring on a figurine, though, because when he sees it heâ€™ll think of â€˜herâ€™. 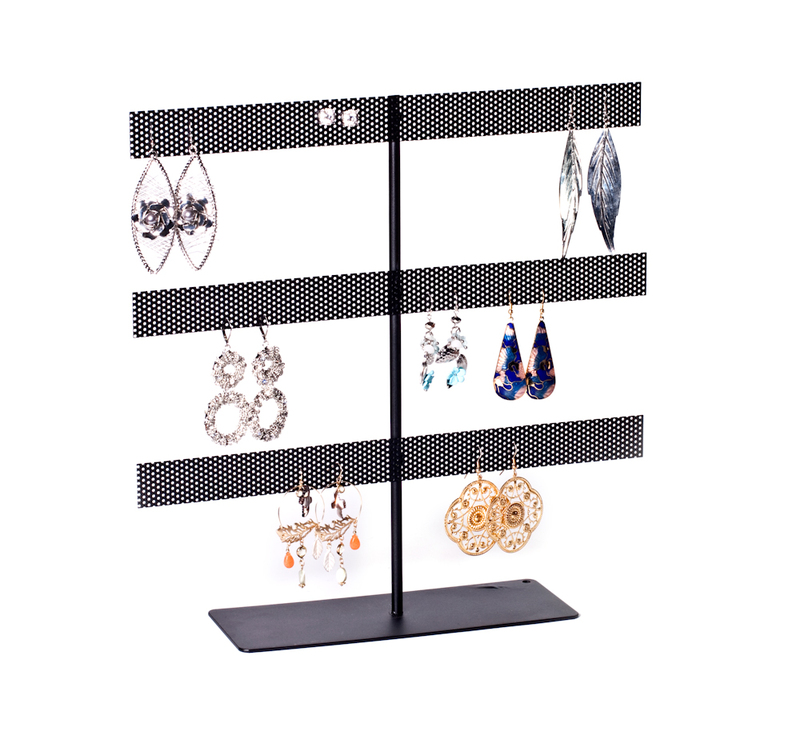 Our newest line of Metal Displays stand apart from all others in the market. 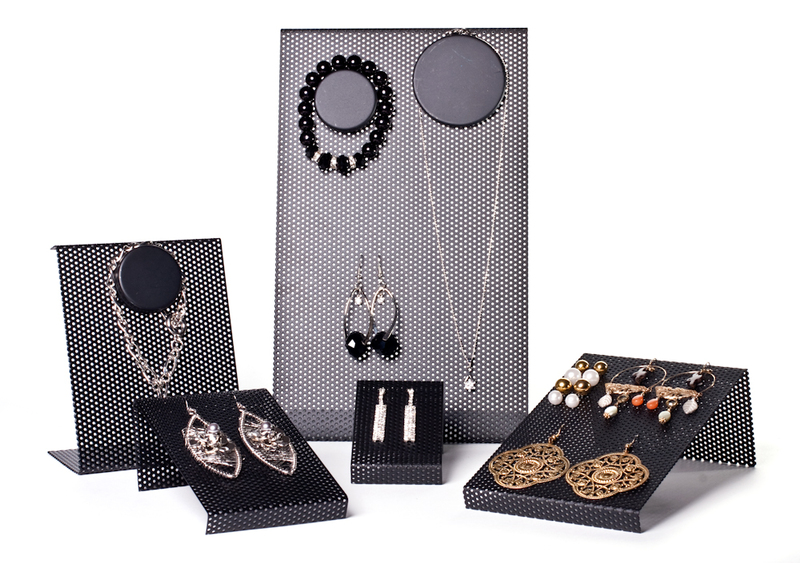 The sleek and innovative design of our Black Metal Mesh Displays allow endless combinations of earrings, necklaces, and bracelets. 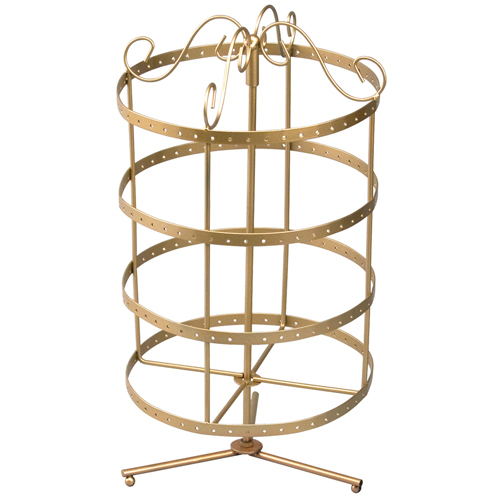 Proudly manufactured in the U.S.A. and uniquely designed, these metal displays are versatile enough to enhance both modern and vintage looks. The durable construction of these displays ensures great use for many years to come. This particular Metal Display (KM Line) can be used standing up on an angle, or laying down on an angle. All KM displays are magnetic, and we highly recommend using both small and large magnets, with both stacked and unstacked looks to create your own unique design. 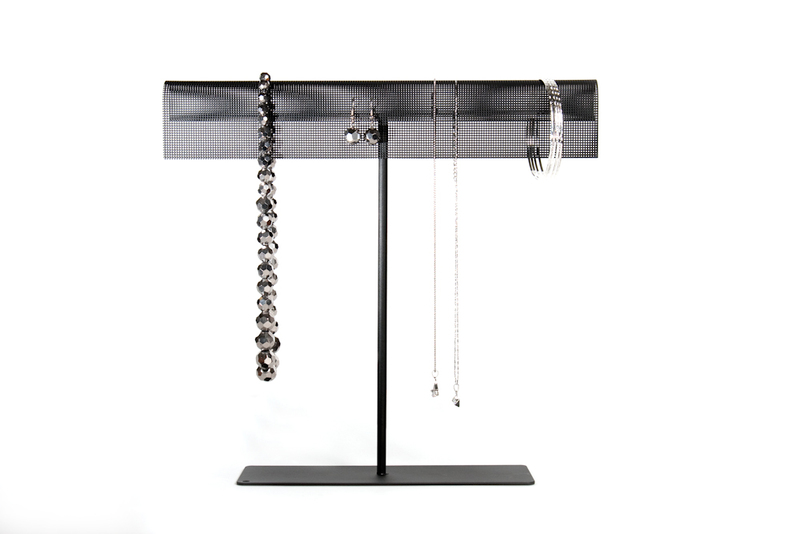 The KM line allows you to display necklaces, earrings, and bracelets all on one display. 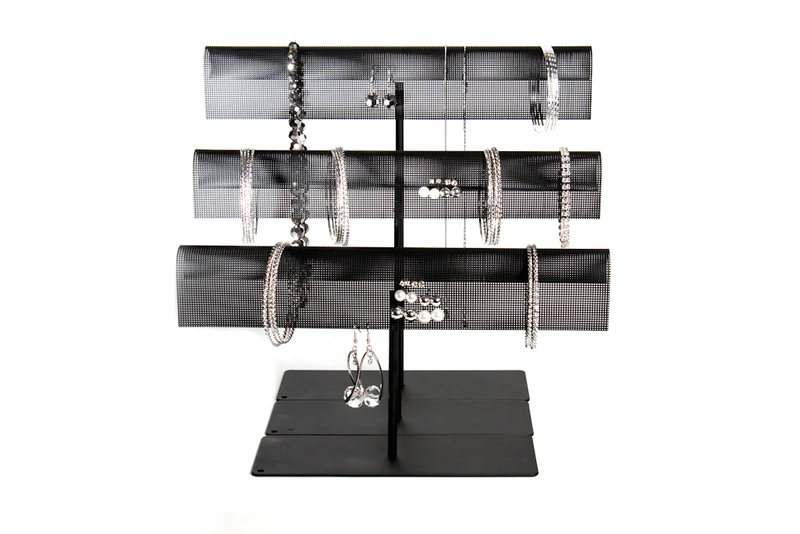 The KLB series is comprised ofÂ upscale and multifunctional t-bars that can be used for hangingÂ earrings, bracelets, and necklaces. When space is limited, this unique t-bar canÂ take care of your display needs. Click on the images to be directed to these items on our site! High Quality Paper Bags Make All The Difference!